Scallops always seemed like a gourmet dish you could only get at a super fancy restaurant. I wasn't quite sure how a normal person would make them. Well, let me tell you the good news . . . they're ridiculously easy. (Personal confession: I have made this same exact dinner four nights in a row: Scallops and Caprese Salad. We'll see if I go for a five night streak.) Pan-Seared Scallops (serves one) 3 - 5 sea scallops (they are bigger than bay scallops) 1 tablespoon butter Seasoning salt (a few shakes) Melt butter in a small saute pan. 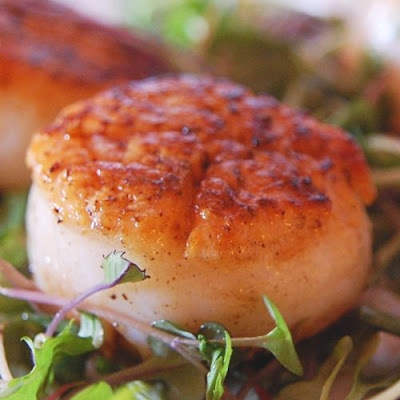 Sprinkle both sides of scallops with Lawry's Seasoning Salt and place in butter. Sear scallops on each side for about 3 minutes, or until opaque throughout. Serve with caprese salad.